As I promised, here's how I wore a brooch this week. I had a business meeting to attend, but on that day it was going to be a sweltering 95 degrees. So, wearing something simple (read: cool) was the order of the day. 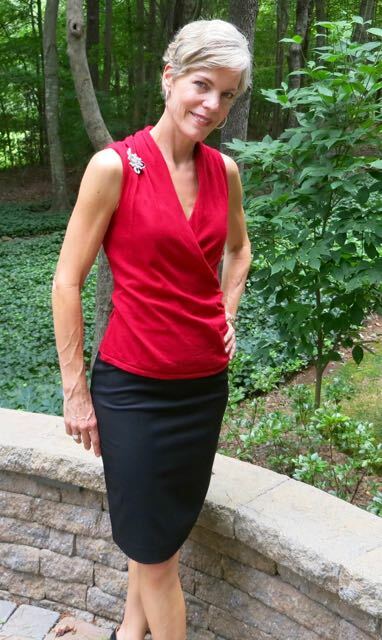 The simple addition of a brooch made my simple top and skirt look special and pulled together. Wouldn't you know it...I got a few nice comments from a couple of ladies that loved my brooch and thought it was a perfect accent to wear that day. Brooches are perfect for summer wearing. Unlike a bold necklace (and often a heavy necklace), they don't heat you up when you are trying to wear as little as possible! Wearing a brooch like this is good because it brings atttention upward. 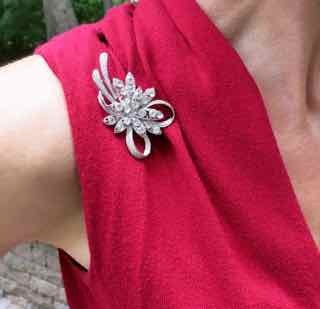 If you are petite, even better, wear your brooch high up on your shoulder. Widen your narrow shoulders, by wearing your brooch wide out to your shoulder line. How are you going to wear your brooch? Of course you can pin a brooch onto your shirt or jacket and look instantly chic. However, I encourage you to think "out of the box" with this week's Style Mission. How else can you wear a brooch? Pinned on a necklace? Holding a scarf in place (so it doesn't move)? Or, how about pinned on a skinny belt at your waist? The options are unlimited! Even pinned on your handbag or headband is a possibility!